So here is our trailer! “Dubstep Trooper” is a Star Wars fan film. This spoof will eventually run about 12 minutes. It is an open source project, both crowd sourced and funded. WHAT IS DUBSTEP TROOPER ABOUT? 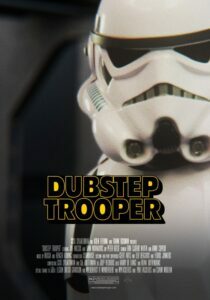 Dubstep Trooper is an untold but key side story to the Star Wars saga. A secret, kept for decades, is revealed as an epic clash unfolds between a rebellious young stormtrooper and Darth Vader. We are a group of young rebel filmmakers. Most of us – particularly the initiators – are currently based in the Puddingfabriek in Groningen, The Netherlands. While some of us have already worked together on a number of projects, we have always wanted to combine our talents to raise the bar. Enter this project: a short Star Wars spoof. We started on this journey in the summer of 2011, principal photography was in december of that year. Since the short film was shot entirely in a blue screen studio our main object at this time is attracting VFX artists to help key and rotoscope all these shots. It is a time consuming job, and since we also have our respective companies to run (and lives to live), we could really use some help. Many have helped us out in getting this far, so ‘the makers’ are many, and might well include you. You might want to see the whole thing. Crowd sourcing is key. Please share the trailer if you like the project. The right artist might see it. A list of co-creators can be found at the trailerpage on youtube. PS: Let me know if you’re missing…ahahah…hm. You can also follow DUBSTEP TROOPER ON FACEBOOK.